Can you have it all? It’s an age-old question and a truly illustrative answer will depend on the unique requirements of each of the seven odd billion individuals who call the planet Earth home. 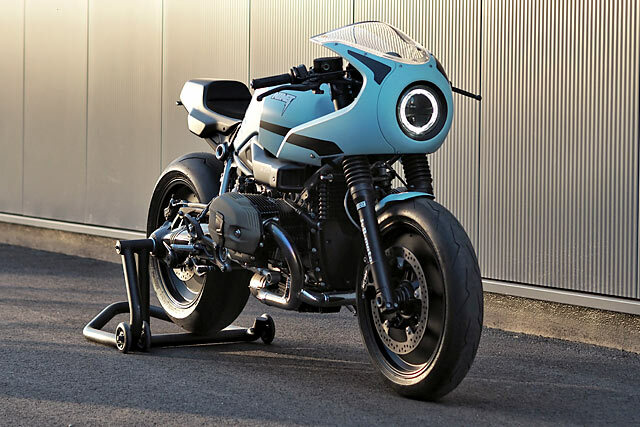 But this isn’t the place for such an esoteric conversation, this is where we come to admire motorcycles and in that particular sphere, Cologne-based JvB-moto has answered with a resounding ‘yes’! 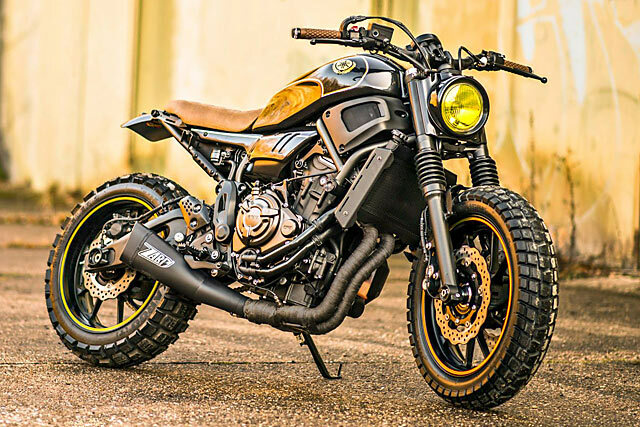 Based on Yamaha’s insanely versatile fun machine, the MT-07 this bike delivers a go anywhere urban warrior possibility, with custom cool, cheap purchase price and a warranty; what more could you want? Of course, the very nature of the custom bike scene is that we all have very different wants and needs, but when it comes to ticking so many boxes it’s hard to think of many builds that do it as well as MT Super7. 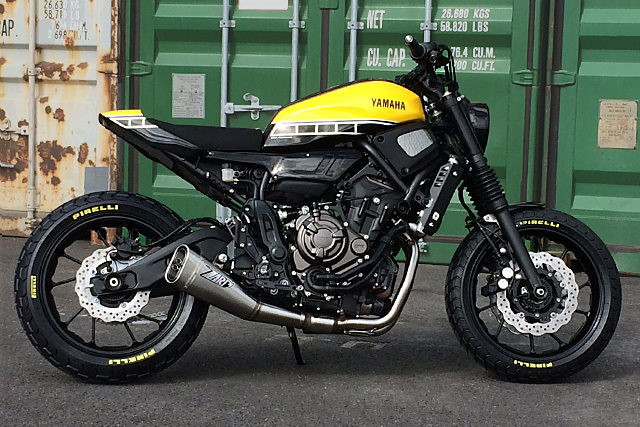 As part of the Yamaha’s incredibly successful Yard Built program, JvB-moto was given the honour of being the first workshop to tackle their new XSR700. Described as a machine designed to have a timeless feel, built on historical icons, matched with tomorrow’s technology for a pure and entertaining riding experience, it has a lot to live up to. 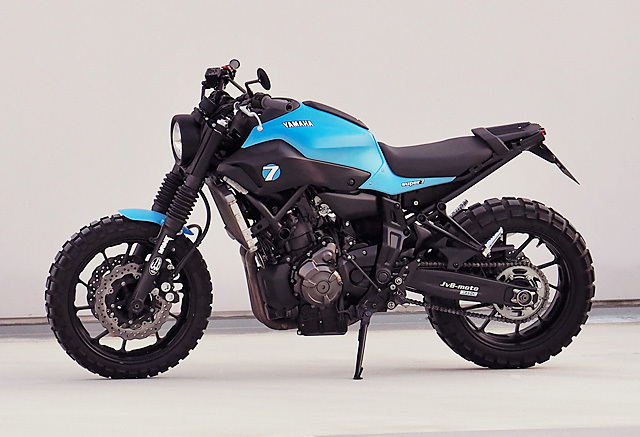 But the XSR700 is no ordinary new motorcycle; it’s neither a modern bike or retro remake, but a return to the UJM (Universal Japanese Motorcycle) that combines a non-era specific look and classic design intellection. 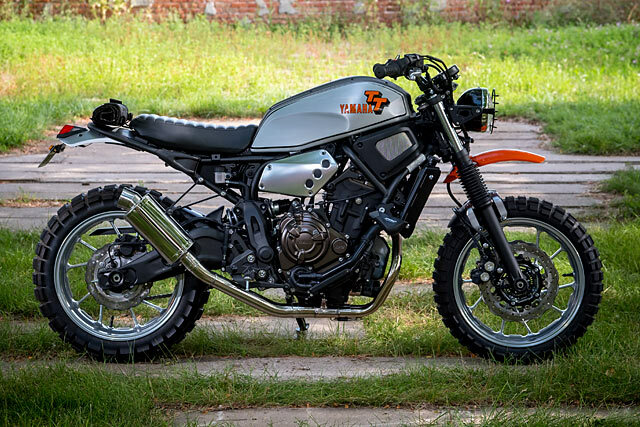 Having done such an incredible job with their first XSR700 build, known as the “Super 7”, JvB-moto led by Jens vom Brauck are back with a Scrambler version that delivers a new, raw and rough attitude to what is becoming the ultimate urban warrior. 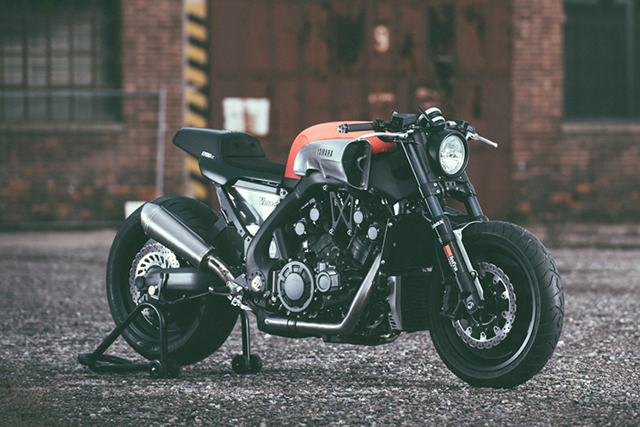 Pipeburn: Must be a good feeling to be approached by the mighty Yamaha to build them a bike. How did it come about? Shun Miyazawa asked me when we met at Wheels & Waves in France last year. I just couldn’t say no. Perfection. It’s a glittering prize that many of us endlessly strive for but few rarely achieve. For all the polished-to-perfection show winners you see around the traps, there’s a million builds that are quit on or just left to rot. 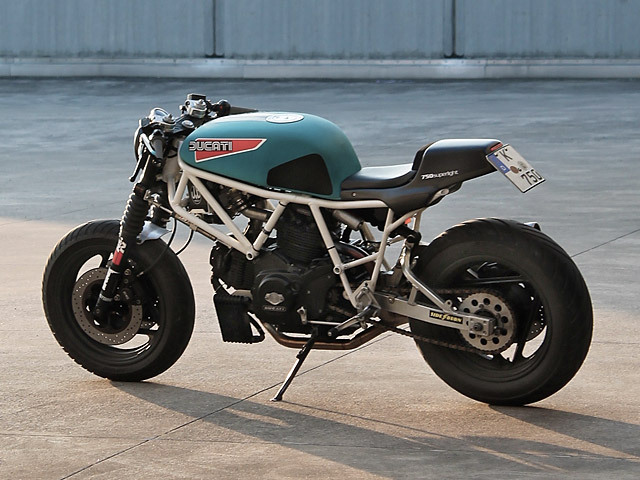 But what if, instead of throwing in the towel on the build itself, you gave up on the idea of that ‘perfect’ bike? What if you took more of a racing approach and simply considered the bike as something that was constantly evolving? A new part here, a modification there. And all with the aim of making something that was just straight up badass and damn fast. Because that’s just what Jens and the boys at JvB have done. And if this is what happens when you kick perfection to the kerb, we’re not so sure it’s such a big loss after all. Being on the receiving end of many custom bike submissions, you tend to get a pretty good idea of just how prolific a bike shop really is. Some we hear from once a year. Some twice. And then there’s France’s Motomax Metz. Believe it or not, this here bike hit our inboxes little more than two weeks after their previous build. At this rate, we’ll be featuring another 26 of their bikes in 2017, and by 2020 France will be nothing but an army of cool Yamaha trackers and a load of fresh mud. 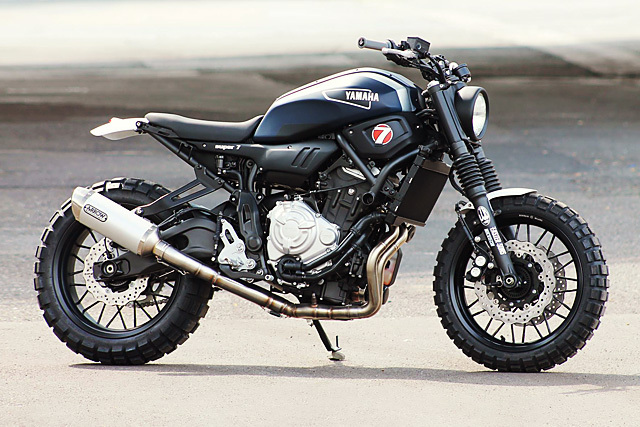 But before that happens, please meet the rad-to-the-bone ‘Dirty Smoke’ XSR700 that will have caused it all. It’s amazing how much the big motorcycle manufacturers have changed in the past ten years. Up until very recently, bike customisers were little more than pariahs to the factories. All their hard engineering work, undone in the fell swoop of an errant oxy torch or angle grinder. You could almost hear the engineers in Japan and Europe weeping in pain. And as for a factory dealer that might dare to try and make a few changes to the merchandise? If they were lucky, they’d find themselves selling second-hand Dneprs in Siberia… in winter. But my, what a difference a decade makes. Suddenly it’s raining factory customs. And for Yamaha, that means throwing money behind their ‘Faster Sons’ custom shop collaboration project. And the latest star of the decidedly successful program is this here XSR700 from French shop Motomax Metz. A French shop that just happens to be a dealer, too. 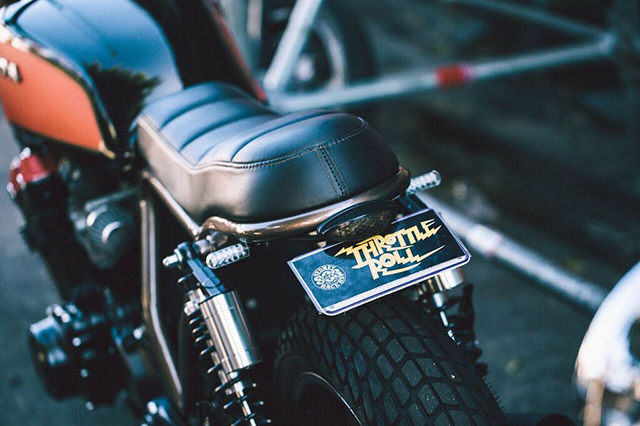 The growing juggernaut that is Throttle Roll was on again for it’s 3rd year, along with it’s sacred mantra; amalgamate Sydney’s colourful bike community and showcase it’s unique builds. Music, food and booze are of course essentials in this holy event. The day starts early, with 300+ riders meeting up at Harry’s café De Wheels. Coffee was being poured down throats as everyone poured over each other’s bikes. The excitement for the day was high and it was time for the ride. The crew headed off south to the Royal National Park, with more riders joining on the way. Soon the group swelled to 500+ bikes. There was now a mass of exhaust and a thunderous roar heading down the Sea Cliff Bridge. It’s always a tough task keeping together such a large number of bikes, often peeling off into several groups, but there’s a ride leader, markers, tail gunners and support vehicles. The battalion of bikes all gathered at Bald Hill car park, soaking up the sun before making the pilgrimage back up to Enmore for the main event. Park up, drink up, and party.